While I understand the history and necessity for turnpikes (roads use to be privately owned and hence, tolls were collected to manage upkeep; states now do the same to balance costs), oh how do I despise them. Especially ones with 3 exits over 7 hundred miles, like Rt 476 (i.e. the NE Extension of the PA turnpike) drive me nuts, as with normal highways you can get off at local towns as you go in order to grab refreshment and nourishment. Not with 476. But occasionally, I decree (with the wife's consent of course) to go off course to grab some local coffee, with the most recent stop being a place called Perk on Main. The joint sits on the Main St of the cute little town of Emmaus, in a cute little store outfitted with a substantial porch and chic outside seating. The inside is a medium-sized room with peripheral seating and large serving area. The coffee comes from Counter Culture Coffee out of North Carolina, a great roaster and purveyor of coffee (also becoming more and more common in the Northeast). I had the La Golondrina via drip, a wonderfully chocolaty and orange-ish coffee with low acidity and a creamy texture. The espresso was also a refreshing beverage, as the barista definitely knew what she was doing and hence pulled a smooth and bright shot with strong flavors of bittersweet cocoa and a nice cranberry tang. The tea is freeleaf and also from Counter Culture I believe. While the sidetrip took me about 45 minutes out of the way, it was well worth it to find a gem like Perk on Main. 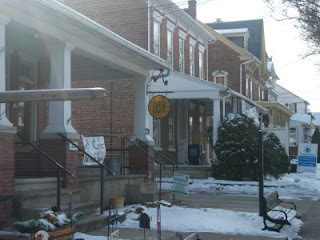 If you're in the nearby area or even driving on 476, take a stop by Emmaus for the Perk on Main.